Previously, I’ve written about Hidemi Sugino, a Japanese pastry chef who in 1991 won the World Pastry Cup with his Ambroisie, an entremet cake made with pistachio, raspberry, and chocolate. By no means, however, are his stores the only place in Tokyo to savour unique flavour combinations—a visit to Japan is incomplete without a bite of one of Sadaharu Aoki’s masterpieces. Aoki is known for combining Japanese flavours, like yuzu, matcha, and black sesame, with traditional French pastries the likes of millefeuille, éclairs, and macarons. And he does a damn good job of it. His stores, in Japan and Paris, are some of the most visited. Unfortunately, unlike Hermé or Ladurée, Aoki does not publish any of his recipes. 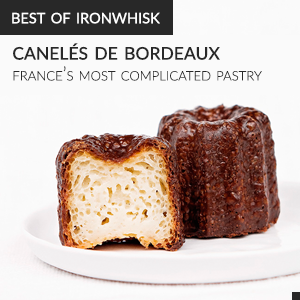 That’s a big problem; his pastries (especially his salted caramel tarts and sesame éclairs) are often some of the highest rated ones on Paris to-eat lists. Descriptions of his salted caramel tarts are vivid: a buttery, crisp tart shell filled to the brim with a luxurious vanilla bean salted caramel and topped with a perfect swirl of milk chocolate mousse. Think of a Twix or Caramilk chocolate bar, but much, much better. I wanted to try them. Alas, flying over to Paris or Tokyo was not an option. Recreating a pastry that I’ve never tasted before was certainly a challenge. I worked off of detailed descriptions and photographs that I had found online of these “perfect” salted caramel tarts. From photographs, I figured out that they had five components: (1) a tart shell, (2) a layer of salted vanilla bean caramel, (3) some type of milk chocolate mousse/cream, (4) a dusting of some type of tan powder overtop the milk chocolate mousse/cream, and (5) a dusting of dark, Dutch-processed cocoa powder. As soon as I understood what the components are, I got to work and made ten. (1) The tart shells were easy. I used a simple recipe from Antonio Bachour’s book, the same one that I used for the key lime and raspberry tarts I made a few weeks ago. (2) For the salted vanilla bean caramel, I used Stella’s recipe for caramel sauce. I had to make a couple of modifications though. I drastically cut down the amount of cream in the recipe (I used about 15% of the recommended amount) so that the caramel would have a more solid texture (I was not going for pourable, like she was). I also increased the amount of salt and switched to fleur de sel, as the description for Aoki’s tart in his stores specifically states that he uses fleur de sel. That being said, I’m sure that using standard kosher salt would work too. Salt is great in caramel because it both cuts down the sweetness and elevates other flavours. (3) When figuring out how to make the milk chocolate mousse, I found a recipe online that claimed to be Aoki’s. I was not convinced, however, because it only called for milk chocolate and whipping cream. From what I’ve read online about the tart, the mousse lasts for quite a while. From the recipe, it didn’t seem like it would. I decided to make a milk chocolate cremeux instead, also from Antonio Bachour’s book. Bachour’s recipe contains gelatin, which helps the spiral keep its shape for a long time. Speaking of the spiral, it was a pain. Piping spirals is incredibly difficult. I had to use a robot. When I first saw the spiral top on Aoki’s tart, I knew that using a robot was the only way I could replicate it. My piping skills aren’t very good. Luckily, in 2005, my parents bought me a LEGO NXT Robotics kit. I still had it. I fashioned together a simple robot, in about fifteen minutes, that spun in a circle. To make the spirals, I simply placed the tarts on the robot and held the pastry bag above them. I pressed down on the cremeux, and perfect spirals formed before my eyes. But, once I got it, I made about half of the tarts with spirals. For the rest, I got too annoyed. I just dolloped some of the cremeux on. I probably won’t bother with the spiral in the future. (4) I had no idea what the tan powder Aoki sprinkled on his tarts was. No clue. It might be ground up tart shells. In any case, I didn’t want to take the risk and decided to leave the powder out. (5) Sprinkling the cocoa powder onto the cremeux was probably the easiest step of this recipe. I used a small sieve and blocked sections of the tart off with parchment paper while dusting, and it ended up wonderfully. These tarts were a bit of a project, especially the cremeux spiral which drove me nuts. That being said, the end result was unbelievable. The milk chocolate complemented the caramel so, so well. The crunch of the shell, the creaminess of the caramel, the smoothness of the cremeux, and the bitter notes of the Dutch-processed cocoa powder are flawless together. Recipe for Sadaharu Aoki's salted caramel tart with fleur de sel vanilla bean caramel, milk chocolate cremeux, and Dutch-processed cocoa powder. Add the almonds, fleur de sel, and all-purpose flour. Beat to combine. Bake for about 20-25 minutes, or until browned. Remove the beans, and cool the tart shells to room temperature. Bring the cream, vanilla beans, and ground vanilla beans (if using) to a simmer over low heat. Turn off heat, cover, and let stand for one hour to infuse. Place a large pot over a medium flame (large is important or else the caramel will overflow and you’ll burn yourself ) to caramelize the sugar. Sprinkle with some of the sugar to form a thin coat on the bottom of the pot. As the sugar melts, sprinkle more sugar in the areas where it is melting. Avoid stirring the pan, and shake and swirl it instead during the process. Continue adding sugar to the areas where it is melting until all the sugar is added. Cook until it reaches what Stella describes as a “foxy” colour, between light and dark brown—so I guess just “brown”. If you see clumps of sugar, then shake the pan. Do not stir. Pour in a splash of the cream as soon as the sugar reaches the proper colour. Stir it in. It will bubble, but as long as you use a large pot you should be fine. Continue adding the cream (and the vanilla beans) gradually and stirring. Then, stir in the butter and the fleur de sel. Strain into a container to remove clumps of sugar and vanilla beans, and then pour evenly into the tart shells. Set in the fridge to cool overnight, or else the caramel will be too liquid to continue. Sprinkle the gelatin over the water and stir to combine. Let sit for five minutes. Bring the cream and sugar to a simmer in a medium saucepan over medium heat. Once simmering, remove from the heat and stir in the gelatin. Pour the cream mixture into the melted chocolate and whisk until smooth. Take the milk chocolate cremeux and whisk until smooth (you can use a stand mixer, if you wish). Add cremeux to each tart and scrape off excess with an offset spatula so you have a smooth surface. 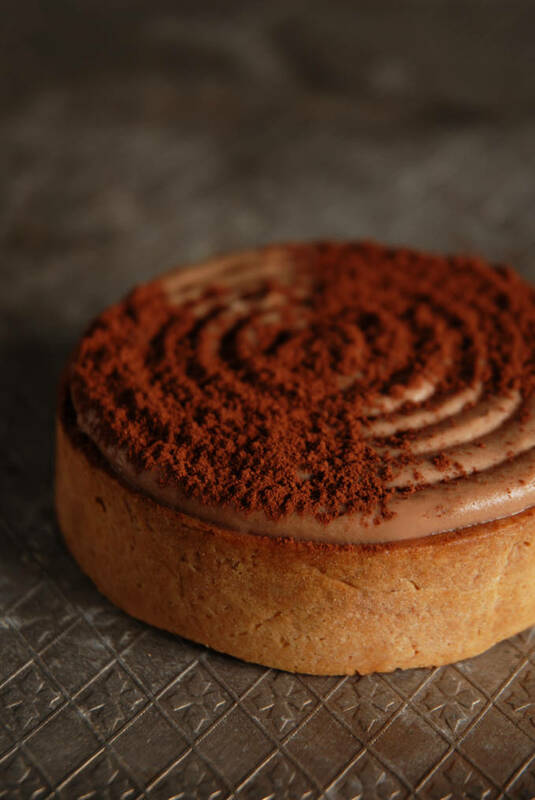 Using a medium-large round piping tip, pipe a spiral of milk chocolate cremeux onto each tart, starting from the outside. You can also decorate with cremeux another way, if you wish. Using a small sieve, dust with the cocoa powder. For Aoki’s tarts, he dusts opposite quarters of the tart presumably by holding a piece of parchment paper above the non-dusted quarters while dusting. This looks delicious! I´m definitely going to bake that … Why travelling to Japan if you give us such great inspirations! Thank you! What an immense amount of work! You’re my hero. :) I can’t believe you built a robot to help with the spiral piping. Amazing! Wow these are no joke!!! That is crazy that you just whipped out a robot to make the spiral…that would never have even occurred to me! It sounds delicious! I’ll be trying this when I want to impress! Stunning photos as well! please show us foodies the inside? I am very interested in trying out this recipe. I read over the instructions, but I don’t see when we should add the caramel to the tart. Before adding the cremeux or after? Thanks! Great photo btw! Hi Memoria, thanks for your question! The recipe is written in the order it should be made, so you would make the tart shells, fill them with caramel, cool overnight in the fridge, and then top with the cremeux (which should be started in advance since it needs to chill in the fridge overnight too, before being added). Hope that helps! Wow! What a showstopper! Caramel and chocolate is probably my favorite dessert combo…and your tarts look amazing!!! This looks PERFECT!! You did an awesome job! How many tartlets does this make? Looks delicious! Hello my friend and congratulations for your perfect work with your great blog…!!! Can i ask you two things please…..
For how many inches tart ring is the quantity of this recipe and especially tart shell..??? Thanks again for your time and the great work…!! Hey! Where do you get your french tart rings from/ what are some good kitchen supply shops around the toronto area? Hi Odie! I actually just use round cookie cutters. They’re way cheaper! I bought them in the US when I visited San Francisco at a store called Sur la Table. There’s not many recommendations I can make for stores in the Toronto area… I heard Golda’s Kitchen is pretty good. IGLOO Food Equipment is nice too. Ah I see, I see. I was going to check out Golda’s Kitchen this weekend, but I had a look around their site and I don’t think I saw tart rings. I found a good source, based in Quebec – lots of rings, baking pans, and silicone molds! The company is Design & Realization in case you’re interested. Shipping isn’t too bad either. I heard that Tap Phong in dtwn TO is pretty popular but I haven’t checked it out. Btws, great blog, love your stuff! This is awesome….was it hard to make? Hi! The caramel goes on the bottom of each tart and the cremeux goes on top. Hey I was wondering if I could take this recipe and use it for a competition but only after I change it to fit within my budget and style of cooking. Please get back to me as soon as possible. I have to turn in my entry by the 28th of this month. Thank you for your hardwork in recreating this recipe. The blond powder might have been kinako – japanese roasted soy bean powder. Perhaps the tan powder is toasted sugar? I believe that Serious Eats posted a very good article on it. Considering it is a caramel tart, that seems very likely. I figured out what it is the other day, funny enough. Sprayed on chocolate! After pouring the cream mixture to chocolate will it be a ganash or chocolate cream?